Do you import it? Like '///<reference path='require.d.ts' />'? Neither worked (both references had a squiggly red underline for the filename). Also, as a global reference in WebStorm, isn't that supposed to be automatically referenced? It's even worse when I access code from Sencha Ext JS. In the case of Sencha we use the file extjs.d.ts that we have in the libs sub-folder while the RequireJS.d.ts is installed from the standard online location. A comment of the form /// <reference path="…"/> adds a dependency on the source file specified in the path argument. The path is resolved relative to the directory of the containing source file"
>Also, as a global reference in WebStorm, isn't that supposed to be automatically referenced? Ok, this is making no sense. I just opened this up again and now it is all fine. Nothing red. And then after 40 seconds - all red again. It all compiles and runs fine. 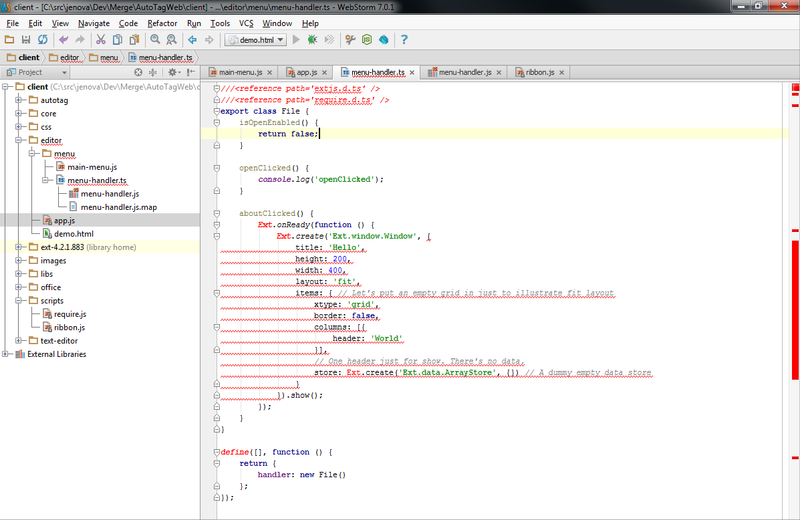 It just says there were errors in the WebStorm syntax checking. It's all good now with the relative reference. Sorry for all the questions on this - I assumed that when I set the project settings to say where the .ts files are, that covered everything. This is all answered now.